KCT is community-based and open to anyone who lives or works in the Counties of Kane, Kendall, DuPage, DeKalb, Grundy, McHenry, and Cook County west of Route 83. At KCT, it is our mission to offer our members superior services and competitive financial products. 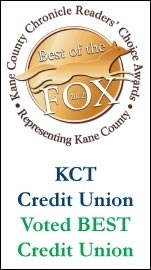 KCT is a not-for-profit financial institution formed solely to serve the financial needs of its members. Unlike other financial institutions, KCT is a cooperative, owned by its members.